Home Events Feast of family fun at Liverpool ONE this summer. Feast of family fun at Liverpool ONE this summer. There’s a feast of family fun on offer at Liverpool ONE this summer. With daily circus skills workshops, live music and plenty of places to eat and shop, there simply has never been a better time to visit. Over the six-week summer break, look out for the special Circus tent at Liverpool ONE, where you’ll find free workshops for kids to try their hand at learning impressive tricks including tightrope walking, plate spinning, ribbon, juggling and trampolining. No need to book, just turn up on the day. Workshops are available Monday to Wednesday 11am – 2pm and Thursday to Sunday 12pm – 4pm, until 2 September. The festival is open to pianists of all ages and abilities so if you want to get involved, either pre-book your space at www.liverpool-one.com/tickle or simply pull up a stool and start playing a tune! Six pianos are available across Liverpool ONE giving the opportunity for everyone to play and to entertain. Or for something sportier, Take part in Ping. Free to use tables are located near John Lewis. Simply pick up your bat and ball from the nearby Utility Store and return them when you’re done. Tables are out every day so there’s never been a better time to play. Liverpool ONE has more than 170 stores, bars and restaurants, a 14-screen cinema, an indoor adventure golf course and an award winning five-acre park. Stores include high street favourites such as Topshop, Zara, Victoria’s Secret, John Lewis and Debenhams. 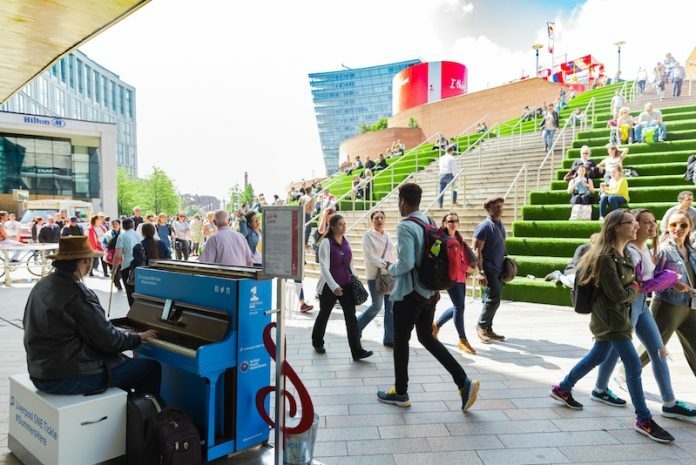 And when you’re done shopping, juggling or enjoying a musical performance take advantage of one of the numerous spots at Liverpool ONE to enjoy the warmer weather. From Chavasse Park to the AstroTurf covered steps near John Lewis, there’s plenty of places for your own summer picnic. Or leave the cooking to the professionals and choose one of the many al fresco dining options across Liverpool ONE for a bite to eat in the sunshine. Donna Howitt, marketing director at Liverpool ONE, says: “Our summer programme is bursting at the seams this year with entertainment for all ages. We want to make this the best summer yet with plenty for people getting involved, trying new things and sharing their experiences with friends. From a day at the park, live music, a trip to the cinema or even a tightrope walking lesson, you’ll be spoilt for choice. And that’s even before the shopping begins. The Circus Camp will run until September 2. Tickle the Ivories continues until September 30. For more information about what’s on offer this summer at Liverpool ONE, visit www.liverpool-one.com/summer.